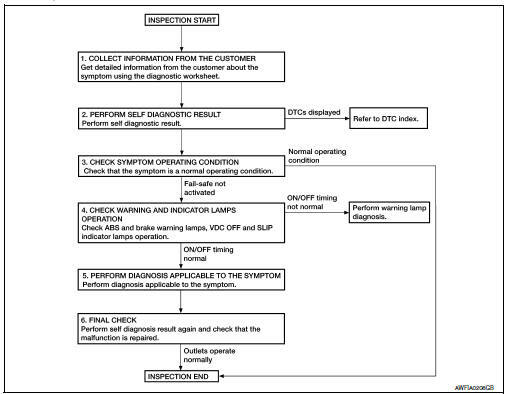 Get detailed information from the customer about the symptom (the condition and the environment when the incident/malfunction occurred) using the diagnostic worksheet. Refer to BRC-52, "Diagnostic Work Sheet". Perform self diagnostic result. Refer to BRC-31, "CONSULT Function (ABS)". Are any DTCs displayed? YES >> Refer to BRC-43, "DTC Index". Check that the symptom is a normal operating condition. Refer to BRC-105, "Description". Is the symptom a normal operating condition? YES >> Inspection End. Check ABS and brake warning lamps, and VDC OFF and SLIP indicator lamps operation. 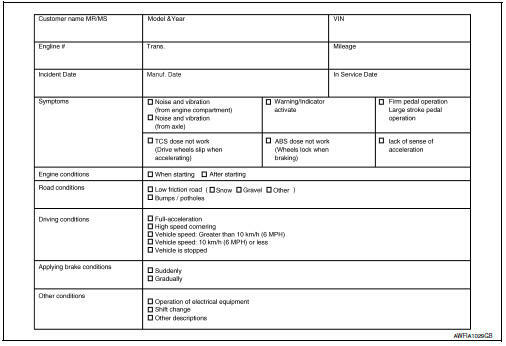 Refer to MWI-8, "METER SYSTEM : System Description". Is ON/OFF timing normal? YES >> GO TO 5. NO >> Perform warning lamp diagnosis. Refer to BRC-94, "Component Function Check" (ABS warning lamp), BRC-95, "Component Function Check" (brake warning lamp), BRC-96, "Component Function Check" (VDC OFF indicator lamp) or BRC-97, "Component Function Check" (SLIP indicator lamp). Perform diagnosis applicable to the symptom. Refer to BRC-98, "Symptom Table". Perform self diagnostic result again, and check that the malfunction is repaired. After checking, erase the self diagnosis memory. Refer to BRC-31, "CONSULT Function (ABS)". When replacing the ABS actuator and electric unit (control unit), perform steering angle sensor neutral position adjustment. Refer to BRC-54, "Work Procedure".